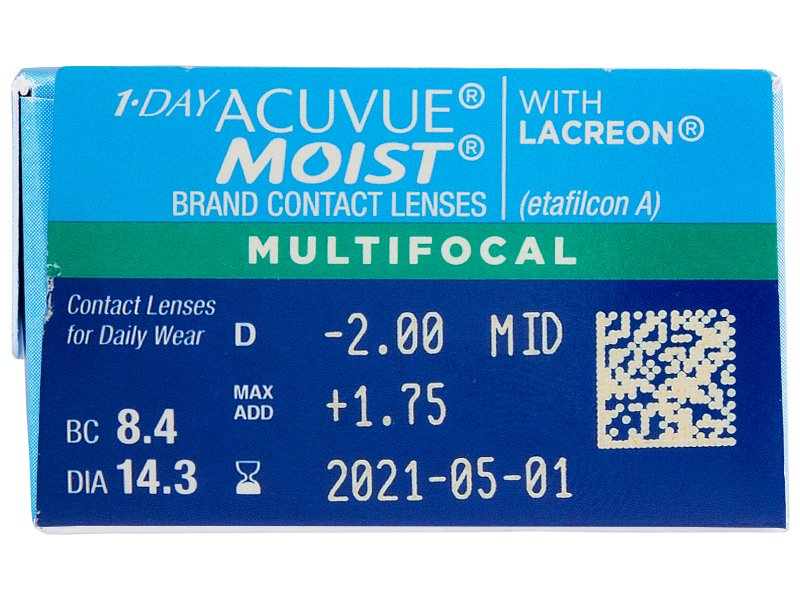 1 Day Acuvue Moist Multifocal contact lenses are daily lenses with an optimised design for users with presbyopia. The lenses have a unique back-curve design that ensures the perfect fit on the eye. This package contains 30 lenses. Also available in a package of 90 lenses. 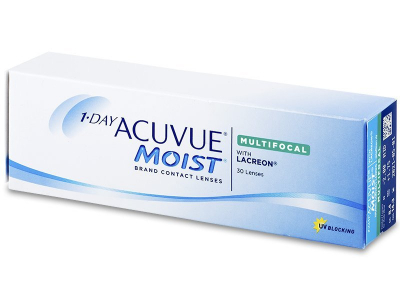 I have used Acuvue TrueEye (and whatever its predecessor was called ) for 10 years, and monthly lenses for 20 years before that but only this summer I decided to try multifocal lenses to reduce my reliance on reading glasses. My optician arranged for a trial of Alcan lenses. I was very disappointed to find they made virtually no difference, so I decided to order a month's supply of Acuvue Dailies in case they were better than Alcan and chose Alensa as the supplier as they appeared to be cheaper and quicker than other suppliers. The lenses turned out to be excellent (though they are extremely thin ) and Alensa were very efficient too. I'm writing this review in the middle of ordering another 2 months supply! I have been wearing contact lenses for 10 yrs and have always used another well known brand. I recently moved house and changed opticians so went for a check up. 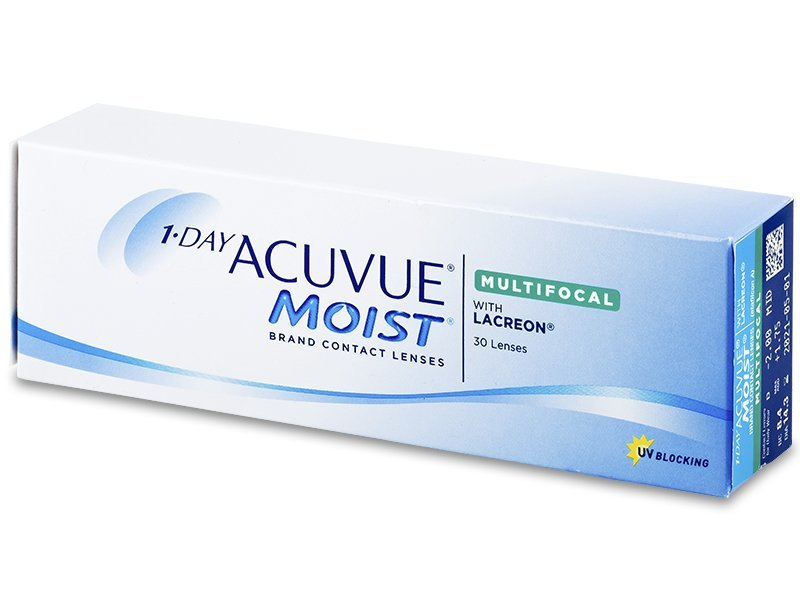 My prescription hadn't changed but they didn't stock my usual lenses so I was given a free trial wwith these Acuvue moist. I can honestly say they are superb. My vision is the best its ever been and I can see clearly at all ranges. The comfort is another big improvement. I no longer feel I have lenses in. I have also changed from monthly to dailies and feel much happier not having to go through the whole cleaning routine, plus if I lose a lense its not the end of the day as I have plenty of extras. All in all I couldn't be happier. These are the first multifocal lenses that I feel genuinely suit me. I mostly wear glasses but when I do wear contacts I always pick these so being able to but 1 or 2 packs online suits me. Hi, Neil, The current price for 30 pairs of lenses would be £36.96. Hi, Steve, It should be a regular power of +1.25 and an add power of High (+2.00D-+2.50D). Dear Sir/Madam unfortunately once you make an order we will ship it today or tomorrow (depending on what time you place the order), meaning you will receive your order next week! I have some trial lenses from CooperVison with BC 8.7 & a Dia of 14.2, will the Acuvue lens fit? Hi, Robert, Please contact Alensa customer service. Hi, Shyin, Our shipping partners don't usually deliver on weekends, so ordering express on Saturday should get to you by Tuesday. Hi I was prescribed Clariti 1 day multifocal (L 0.00 Add HIGH and R +125 Add LOW) but the BC is 8.6 and DIA is 14.1. I want to change to Acuvue Moist but the BC is 8.4 and DIA is 14.3 which is different and they don't do the 8.6/14.1. Can I still change and will it make any difference? Hi, Kate, Of course, it is always better to check with an optician, but small differences shouldn't be a debilitating issue! My right eye lens should +1.75 +2.50 Do you have this available? Hi, Christina, Thank you for your recent comment. It doesn't look like we have that prescription at the moment. However, we're constantly updating our stock, so hopefully we'll have more optimistic news for you in the future. Please feel free to contact us should you have any further questions! I have been wearing Air Optix multifocals for the past 7 years. 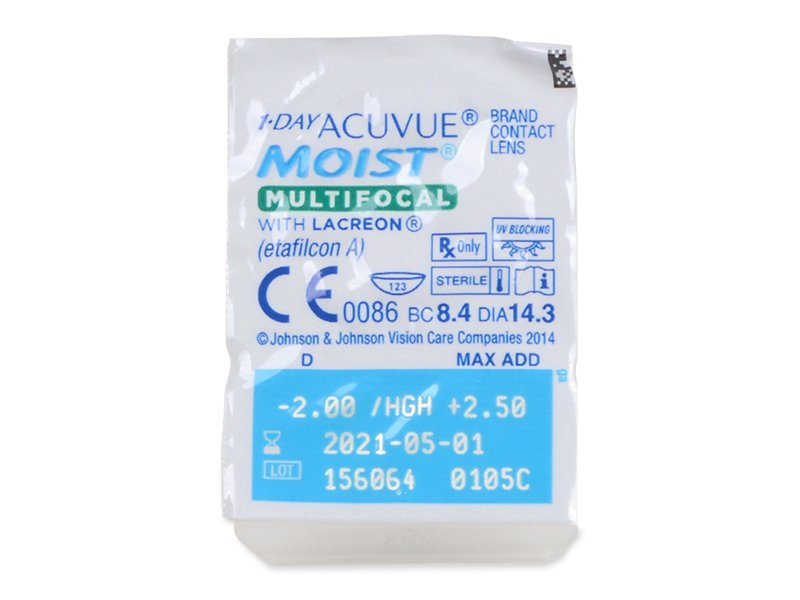 However, I have found over the last couple of years that monthly multifocals sometimes irritate my eyes and, although I have the best distance vision with these, I sometimes have to wear mono focal dailies (Acuvue Moist) which have much better close up focus but I lose the distance (unable to drive at night in them). Although the multi-focal dailies are much more expensive, I would like to try them again to see if my vision is the same as with the monthlies when my eyes need a rest. However, the 'Add Power' is confusing as the daily multifoca 'Add Power'l is different to the monthly lenses, particularly for the left eye. 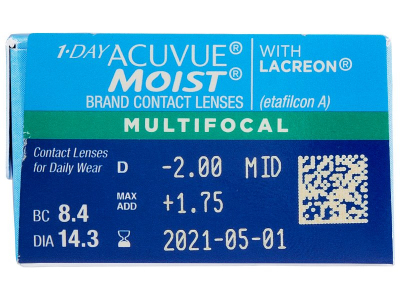 My monthly contact lens perscription is: Left: PWR +1.00 med (Max Add +2.00) Right: PWR +1.50 Hi (Max Add +2.50) What would be the equivalent for Acuvue daily multifocal contact lenses? Hi, Sue, Thank you for your recent comment. According to your prescription, you need 1 Day Acuvue Moist Multifocal with the add power High (+2.00D, +2.50D) for both eyes so you ordered correctly. But those lenses have different BC and DIA than the monthly Air Optix Aqua Multifocal and are made from a different material (Air Optix silicon-hydrogel Lotrafilcon B and 1 Day Acuvue hydrogel Etafilcon A) so it might be the case that the daily lenses will not be so comfortable for you – just be aware!